A bursa is a sac containing a viscid fluid. Bursas are situated at places in the tissues at which friction would otherwise develop. The function is to reduce friction between tissues when these move in proportion to each other. That is why you see bursas between, for example bones and tendons. Bursas are also found where bone protrudes under the skin, which protects the bone against pressure and wear, for example over knees and elbows. 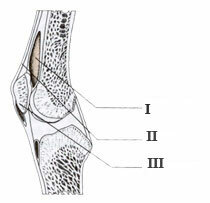 Inflammation of a bursa (bursitis) may occur if the bursa is exposed to high load or friction. It can be seen after great physical exercise, repeated similar movements (running, jumping), or at work, requiring prolonged rest on, for example elbows or knees. This irritates the tissue, leading to formation of increased fluid volume in the bursas. Bursitis occurs most often without bacterial involvement (the exception may be if a wound in the skin provides access of bacteria to a bursa). Bursitis is usually an acute condition, but some may experience recurrent or chronic bursitis. The most commonly afflicted joints are the shoulder, elbow and knee, but bursitis can develop in any bursa. Bursitis can be developed by anybody. People with connective tissue diseases, gout and a tendency to develop tendinitis, however, have an increased risk of developing bursitis. Bursitis is acute, develops after some time great physical exercise with symptoms of swelling, heat, redness and pain over the area. The pain increases if the physical exercise continues. Fluid can be felt in the bursa when you touch it. The pain can be so severe that it radiates to the arm or leg. Commonly the pain will worsen during the night. The diagnosis is made relatively easily by the doctor from the appearance and symptoms, associated with a medical history, often involving prolonged pressure on to the area of the body. In case ofrecurring bursitis and symptoms from other joints in the body, other illness such as rheumatoid arthritis must be excluded. It may also be necessary for the doctor to puncture the burse to remove fluid for testing for bacteria or crystals, which is seen in association with for example uric acid gout. If you have had bursitis it is important to avoid the physical exercise that cause this condition in the future or at least halt this exercise should symptoms start to reoccur. If increased temperature is experienced while having bursitis it is important to consult a physician. Bursitis is usually a benign, short-term condition. The most important part of the treatment is relief and rest of the involved joint. Initially it can soothe and relieve the swelling if an ice bag is placed for 15 minutes over the joint. In addition, you can take some light analgesics, which also may alleviate the swelling, for example aspirin, or arthritis medications such as Ibuprofen, Ipren and others. In more severe cases, it may be necessary to drain the bursa, and possibly inject adrenal cortical hormones in order to alleviate the inflammatory response. If bacteria are found in a bursa the patient should be treated with antibiotics. By repeating cases of bursitis in the same bursa, one can be forced to remove the bursa This is most often done by a small operation in a local anesthesia. Chronic bursitis can cause destruction of surrounding structures and limitof joint movement. This is seen most often in chronic bursitis of the shoulder joint. The vast majority of cases will heal after one to two weeks with sufficient rest.